Ever since I decided to head full frontal down the beauty blogging path my mind has literally been focused on beauty products at least 90% of the day. Now as i'm still on a spending ban (cry!) 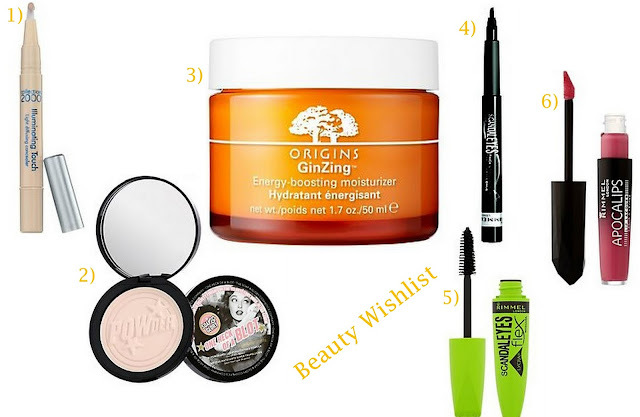 I've not been able to buy many beauty products (except some new skin care products which will be reviewed next week) so I decided to create a little wishlist of things I will more than likely be buying come September. 01// I love my Collection lasting perfection concealer like the rest of the world don't get me wrong but I think it might be time to try something different. I'm hardly going far as this is another Collection concealer but I just thought I'd like to try this one and then maybe do a little comparison review. 02// Again, I love my rimmel stay matte powder but I think i'm just in the mood for a change. I've heard a lot of good things about this powder and the Soap and Glory make up range in general so this is definitely something i'd like to try. 03// I'm really getting into my skin care at the minute and my goodness you cannot read any blog without this appearing somewhere! I love the colour of the packaging and I think i'll be saving my Boots points in order to purchase this. 04// I've recently started wearing winged eyeliner again after taking a little break ad i'm afraid my current felt tip eyeliner just isn't cutting it at the minute. I love the majority of Rimmel products so hopefully this one will become another one of my favourite items. 05// I love this mascara, it does brilliant things for my lashes. My mum has this at the minute and I definitely need this in my makeup collection. It is the perfect mascara for my lashes! 06// Finally i'm a little late on the band wagon but when these bad boys came out I was just discovering my love of Mac lipsticks so I have a pretty good excuse. Anyway, these look brilliant. I've read a lot of good reviews on these and I think the shade 'big bang' would be the perfect addition to my ever growing lipstick collection. What products are you lusting over? I really want to try that rimmel mascara, heard so many good things about it!